Colleen arrived today for a visit. Tonight we cooked a delicious dinner at the house. Julie joined us. On the menu: prosciutto-wrapped cantaloupe appetizer, grilled chicken, risotto Milanese, sautéed brussels sprouts and homemade lime sorbet for dessert. Oh. My. These aren’t pretty, but they’re delicious. Halve and remove seeds from cantaloupe. Scoop out melon balls. 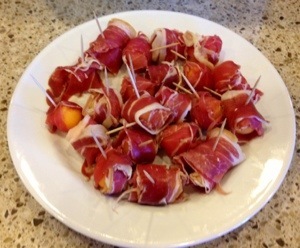 Wrap with prosciutto, Skewer with toothpick. Previous Previous post: Late bloomers. Next Next post: Working on my wannado list.